Quick break from the Europe posts! Last weekend, we had a lot of roast duck leftover, and I got the idea in my head that it would be much nicer stir-fried with beanshoots, rather than being simply reheated in the microwave. And right I was too, heh! I made this recipe up myself, which is unusual for me and Chinese recipes - normally I follow Fuchsia Dunlop's recipes to the letter - but I think that after having cooked Chinese food so often recently, I'm starting to get a lot more confident with it, understanding which flavour combinations go well together. Essentially I just picked the bones out of the leftover roast duck, making sure I got a bit of duck fat for stir-frying, and pieces of skin to make crisp bits for garnish. (I reasoned that if chicken fat is good for stir-frying, duck fat must be even tastier!) Often when you buy roast duck, you'll have a few pieces that are disappointingly un-meaty, just skin, fat and bone - those are perfect here! I've specified 100-200 grams of duck meat in the recipe below, but obviously this will depend on how much you actually have leftover! No need to be too precise about it. The above picture looks reasonably neat, but picking apart the duck is a messy, greasy, process. I would suggest using food gloves, if you have them. It's not a good idea to try and slice the duck pieces if your hands are still greasy - danger, danger! I tried to slice everything into strips that were roughly the same size as the beanshoots, just like in those three-strip noodles you can get at Cantonese restaurants. Below we have the duck, the bean shoots, spring onions and red capsicum. The prep took a little bit of time, with all the slicing, but the actual cooking was very quick - less than ten minutes all up. A bowl of white rice, and it was complete. I loved it! 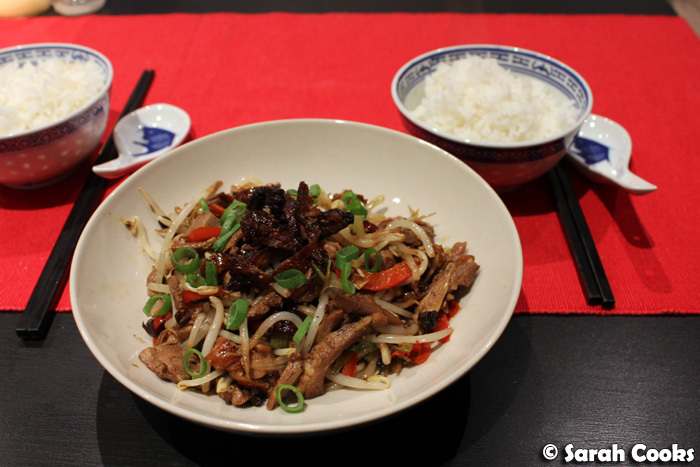 It's a great way of using leftover roast duck - stir frying it, rather than microwaving it, keeps it luscious and prevents it from going dry. The roast duck already has a lot of flavour in it, so I only added small amounts of garlic, soy sauce, black vinegar and sesame oil. 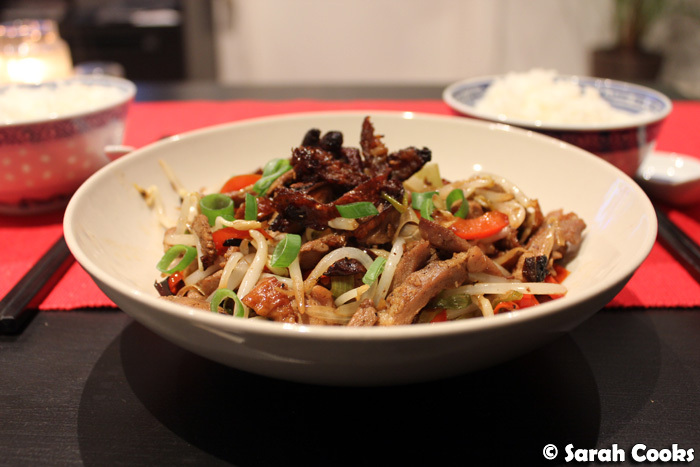 I loved the refreshing crunch of the bean shoots and capsicum, which offset the rich duck. Easy easy and super tasty - hop to it! 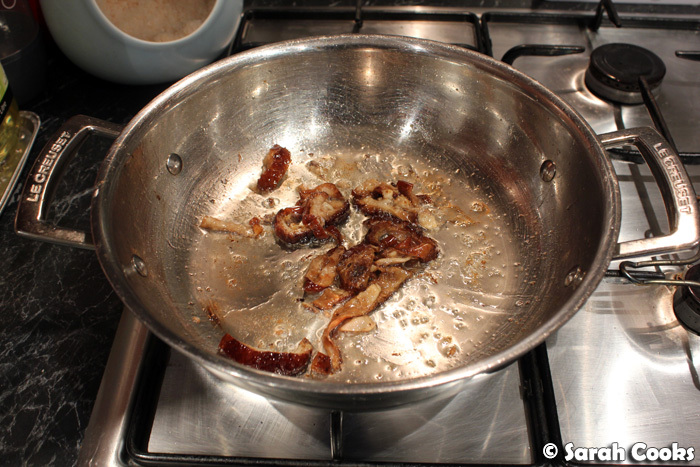 Heat a small splash of peanut oil in a wok, and add the excess fatty bits and reserved, sliced duck skin. 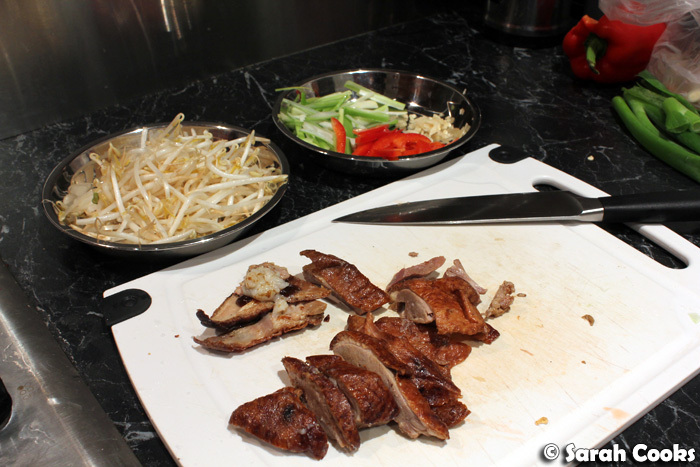 Stir fry over a medium-high heat until the fat has rendered off and the slices of duck skin are crispy. Remove the crisp bits and set aside. Scissor the dried chilli into thin pieces and add to the wok, along with the garlic. Stir fry for a minute or two. Add the red capsicum and spring onions, stir frying for a minute, or until they start to lose their rawness. 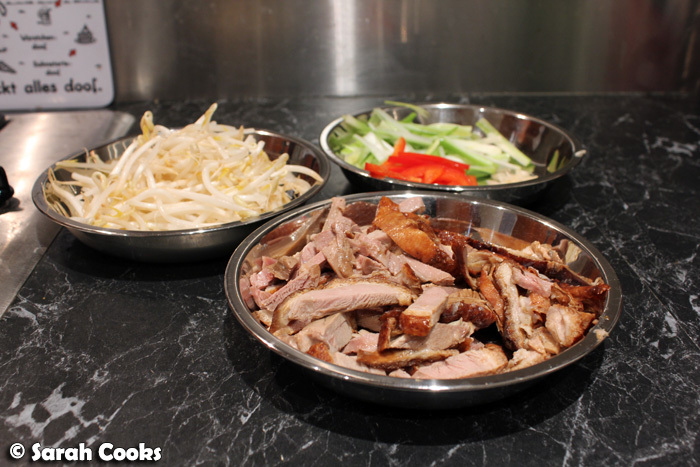 Toss in the bean shoots and duck slices, stir-frying for 2-3 minutes until piping hot. Off the heat, stir in the soy sauce, black vinegar and sesame oil. Garnish with spring onion greens and duck crackling, and serve with steamed rice. Dude. This be ingenious! Totally good enough to buy duck for in the first place. I've never tried a Fuchsia Dunlop recipe before but perhaps I should start giving them a go - any recommendations? I can almost take it just looking at it! I love the sound of duck crackling! Duck crackling?! omg! And lolol at your comment about concerns about duck fat. "...is duck really the meat you want to be eating?" The bigger question is, who actually has leftover roast duck? Heh.